The Suspenz SK Airless Cart makes getting your boat to and from the water stress-free and easier than ever. Unless you own a whitewater kayak or a very small sit-on-top, then you know just how frustrating and burdensome it can be to get your boat all the way to the water. Even if you live on the water, carrying your boat that last 100ft still usually requires the help of another person. Fortunately, kayak carts like the Suspenz SK Airless have been invented to make your boating experience more enjoyable and relaxing. Like most kayak carts, the Suspenz SK Airless Cart is effectively a dolly or hand trailer that takes the majority of your boat's weight and puts it on the cart. This particular kayak cart is a center mount cart which means that it will sit underneath the middle of your boat and absorb nearly all of your boat's weight. This cart includes tie down straps that allow you to tightly secure your boat to the cart so you can confidently travel over rough terrain without fear of your boat falling out. The SK Airless has two durable, non-marring rubber pads that your boat sits on. These pads help prevent slipping and won't mark or damage your boat's hull. The wheels on this cart are AIRLESS! This is the new and improved version of the Suspenz SK cart that has plastic rims and wheels which means they can never rust and never go flat! The frame of the cart is made from T6 6063 Aluminum and the hardware is stainless steel, so the entire cart is rust proof - a must for any quality kayak cart. The entire cart can be quickly and easily folded down for storage and transport. Included with the cart is a heavy duty mesh bag with shoulder strap that allows you to tote around your folded cart. We offer a variety of Suspenz kayak carts so understanding the differences between each model can be confusing. For you convenience, we have created a chart that allows you to quickly see the different features of each cart. See below. Will this cart work with my perception pescador 10 sot kayak? 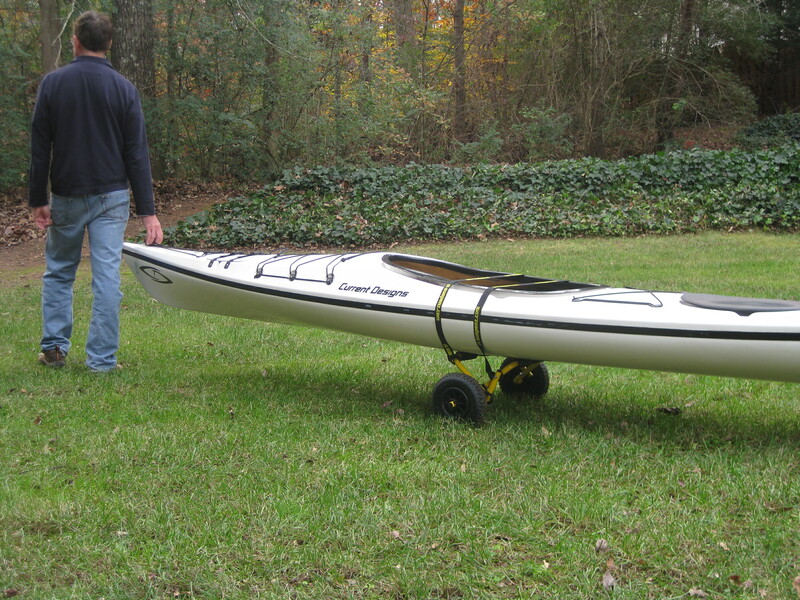 For your Perception Pescador SOT Kayak, you would want a cart built for SOTs, such as this one: http://www.storeyourboard.com/sit-on-top-kayak-hand-trailer-suspenz-sot-cart/. It is designed to fit through your scuppers; the scupper arms are adjustable to fit scuppers up to 26.5" apart. Alternatively, this deluxe cart uses tie-down straps (it doesn't use scuppers), but it is also suitable for SOTs. Are the wheels quick release wheels to disassemble for stowing onboard? Also, is this suitable for a Swift Caspian Sea 15.2' touring kayak w/rudder, 15" depth, pulled over grass/dirt/gravel launch areas? The wheels on this kayak dolly are quick release, so you can easily remove them from the cart or reattach them. As to whether it will work for your Caspian Sea Touring Kayak -- I believe it should work for that model based on its specs that I can see online. At a beam width of 24", it should sit fine on the mount. I didn't see the weight of that model, but you want to make certain it you aren't using it for a kayak that is over 100 lbs - it needs to be less than that. The only remaining question is how well it will work over your mixed terrain. The tires are versatile; they are the no-flat type which helps; I can't say they are the best tires over very sandy conditions... meaning, if you are in certain types of sand, and it is over that type of sand you are towing the kayak, they are not the big beach tires that work best on all sandy conditions. That being said, they work fine over a mixed terrain including some sand to get you to the water. Since conditions/types of sand can vary, that would be my main disclaimer. The grass, gravel, etc. should be fine since they are tough tires otherwise. Can you stow this cart in the hatch of the kayak? When folded up, this kayak cart has these dimensions: 24" x 10" x 4" (when folded) -- so you would need to look at the size of your kayak's hatch to determine whether it would fit in there or not. This product is easy to assemble, comes with its own carrying bag, and really does the trick. I never have to worry about inflating the tires and my wife can easily strap in her kayak with no help and no worries. Finally, a product that does what it says it will do. I recently bought your Kayak Hand Trailer and have used it twice. The design is simple and the piece is lightweight, allowing me to place it in my ocean rowing shell. I live on the Gulf of Mexico so will be interested to see how it holds up to the salt water, even though I have and will rinse it with fresh water after each use. So far it's a great product.